… is how Sally Struthers might have introduced today’s post. But I’m not her. 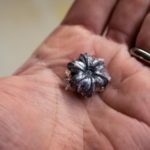 So I’ll just say that if you watch this next installment of our Start Shooting Better series, you’ll find a description of another great shooting exercise: The Super Test. Or as always, you can scroll down and read the full transcript instead. CHRIS: Ballistic Radio. Today we’re looking at the… Super Test? Is that what we’re calling it? CHRIS: Errr, Ken Hackathorn came up with The Test, then Wayne Dobbs and Darryl Bolke [of Hardwired Tactical] evolved it into The Super Test. So, tell us about that. JOHN: So what we’ve got is three strings of fire at 15, 10, and 5 yards. 10 rounds each. At the 15 yard line, you’ve got 15 seconds to, either from the low ready or the draw depending on which version you’re running, fire 10 rounds. When you move up to the 10 yard line you’ve got 10 seconds and from the 5 yard line you’ve got 5 seconds. So the goal is to shoot a 270 or above and then I think, as Darryl puts it, if you shoot a 290 or above, you’re really good. John finishing the Super Test at 5 yards. CHRIS (VOICE OVER): The target for this test is an NRA B-8 repair center. You can buy these as 10.5-inch square targets, or print your own on standard 8.5×11” printer paper [download here]. 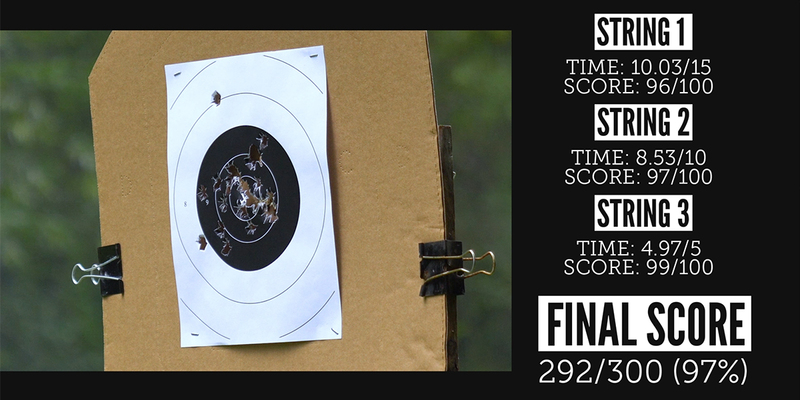 The test is scored based on the scoring rings on the target. So, 10 points for hits in the 10-ring, 9 points for the 9-ring, etc. You get no credit for rounds that miss the paper entirely or for any rounds that are fired after the time limit is up. 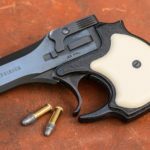 The starting point for the standard Super Test is a low ready position, and if you want to shoot the Advanced Super Test, you can start from the holster. Starting Position: Low ready. Draw from the holster for the “Advanced Super Test”. Scoring: Use target scoring rings and add up your total points for all three strings. Hits off the paper or over the time limit are not counted. 300 possible points. Passing score is 270 (90%). A score of 290 and above is considered outstanding. Single Stack Version: If you’re running a 1911 or other lower capacity single stack pistol, you can use the same distances and time limits, but you’re going to fire 8 shots at each string of fire instead of 10, and you will start from the holster. Just like the standard Super Test, a passing score is 90% which, in this case, is 214 out of 240. Since they’re both big fans of the wheel gun, Wayne and Darryl also came up with a revolver version of the Super Test. 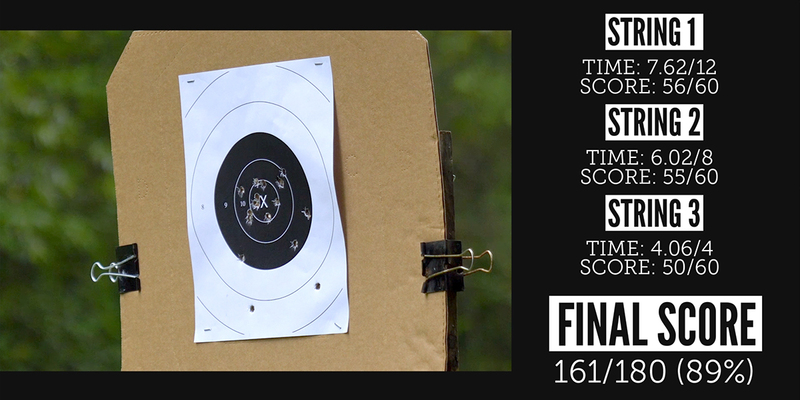 The distances are the same, but the time limits have been adjusted to be more appropriate for 6-round strings of fire. Starting Position: Low ready. Draw from the holster for the “Advanced Revolver Super Test”. Scoring: Use the same scoring method as the standard Super Test. 180 possible points. To receive a 90% passing score, you will need 162 points. CHRIS (TO JOHN): Where I have a hard time with this is just judging how much time I’ve got. Like, at the 10 and the 15, I tend to shoot them in about the same amount of time and I end up blow shots at 15 with time left. So it really kind of messes with your ability to judge time, distance, and how slow you need to go to get your hits. JOHN: It’s not even slow, necessarily, it’s “what process do I need to focus on?” And I stole that from Ben Stoeger, that’s not my original concept. Do I need to pay more attention to the front sight? Do I need to pay more attention to my trigger press? How much time do I have to do it? So, emotional control. I’m at 15 yards, I know I’ve got 15 seconds, that’s plenty of time to concentrate on these things. Then I move up to 5 yards and I’ve only got 5 seconds, I need to have enough emotional control to not search around for the front sight and just get a “good enough” sight picture for that distance and that target. CHRIS: Right, so it really helps you to figure out what’s necessary at what distance. JOHN: Right, so what do I need to do to get the hits that I need to get with the problem that I am presented with. 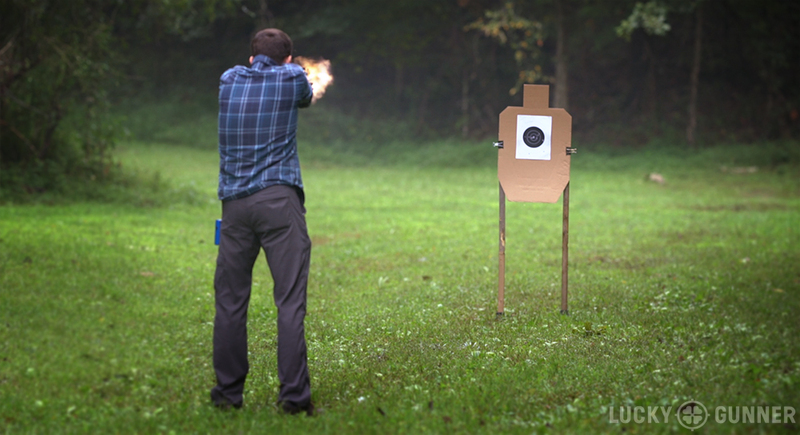 Chris running the revolver version of the Super Test at 10 yards. CHRIS: I know Tom Givens has pointed out on several occasions that a problem he sees with a lot of shooters is that they always shoot the same speed, no matter the size of the target or how much time they have. JOHN: Right, so it’s going to be really dependant on your level of skill and what you’re seeing, but generally, when I’ve messed up things like this in the past, I’ll shoot it too fast. Everybody wants to Ricky Bobby, I want to Ricky Bobby and it’s like, “I like to go fast!” So that’s what I do. But for something like this, it’s really important to know your own level of skill and it’s actually really good for gauging your own level of skill and also it’s a really good test of consistency. Is my performance consistent from this day to this day to this day and it’s really useful for stuff like that. CHRIS: Cool, well, we’re going to give that a shot. We’re shooting on B-8 repair center targets. I’ll shoot it, John will shoot it, and we’ll see how we do. CHRIS (VOICE OVER): John and I both shot the advanced version of the super test, so we started from the holster rather than the low ready. John is using his carry gun, a custom Boresight Solutions Glock 34. He finished the 15-yard string in 10 seconds, well under the time limit, but he dropped 4 points out of a possible 100. He made a little better use of his time at 10 yards, finishing in 8 and a half seconds, and dropped 3 points. And on the last string, he only dropped one point, and beat the time limit by just 3/100ths of a second. So John’s final score is 292, which is an excellent performance for the Super Test. I decided to try the revolver version of the Super Test, so I used my Smith & Wesson Model 66. Just like John, I finished way under the time limit on the 15-yard string, and dropped 4 points. I finished the 10-yard string in 6 seconds and dropped another 5 points. At 5 yards, I nailed the 10-ring with all 6 shots, but I was a little too slow and went just over the time limit with my last shot. That means I have to deduct 10 points from my final score. So I would have had a respectable 171/180, but my actual final score is 161, which is one point short of a passing score. The Super Test is a lot harder than it looks, and if you’re trying it for the first time, I suggest starting from the low ready position. So, grab some B-8s, get out to the range, give it a try, and let us know how you do.